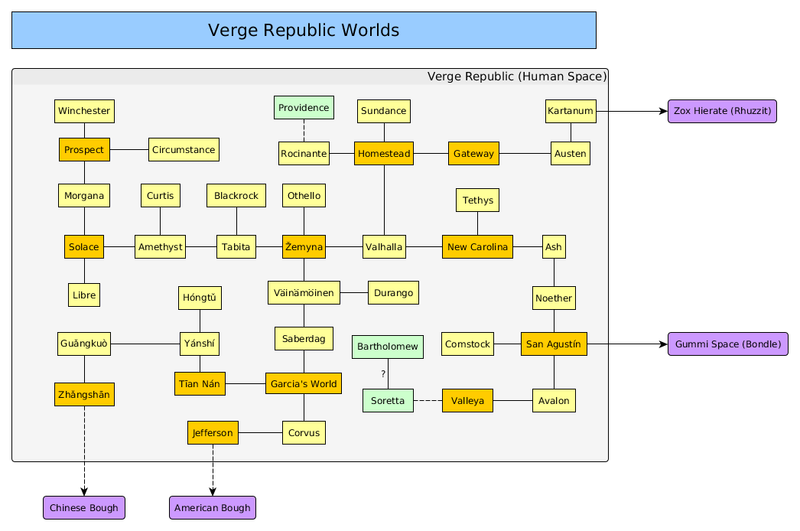 The connection map of worlds in the Verge Republic. Major worlds are shown with a mustard color; minor worlds, small colonies, research bases, and mostly uninhabited connector stops as light yellow. Lost worlds that were once part of the Republic are light green, and broken wormholes are shown as dashed lines. Worlds lost during the Bump in the Night are too numerous to show here. Many of the minor worlds are uninhabitable or only marginally habitable. Many of these were initially contacted primarily for strategic purposes, in order to deny regions of the galaxy to other nation-states from old Earth, and their wormholes were maintained for similar reasons. After the Bump in the Night, the legacy wormhole network connections remained because it was always too much bother to change them. All the worlds described here (except those which have been lost) are administered as territories of the Verge Republic rather than full member worlds. Residents of minors worlds may vote for the President of the Republic, but are not represented by senators at the federal level. They are allowed one congressmen in the House of the Verge republic in an advisory capacity, who can serve on committees but not vote on legislation. In practice, people staying in a colony on a temporary basis (such as a tour of duty in the Republican Army, or assignment to a post on a corporate mining facility or academic research station) remain legal residents of their previous world, assuming they pay taxes and perform other civic duties of that world, and are allowed to vote for representatives and senators from their home world and legislative districts. The duration of temporary has never been adequately defined by the federal government, and some "temporary" residents have been living on territory worlds for hundreds of megaseconds (decades). Territory worlds do have local governments, and the residents can vote for legislation at the local level. High levels of carbon dioxide make the atmosphere of this otherwise habitable world unbreathable (except to Gummis). Explorers require breathe masks with scrubber filters or SCBA equipment to survive. The climate is hot and muggy, except near the poles. It gets its name from the purple autotrophes that grow luxuriantly over much of its land surface. A world in the throws of geological upheaval. Much of one continent is a sea of molten lava. Regular eruptions spew volcanic ash into the air. The seas are mostly anoxic save for the first hundred meters depth, and frequent ocean overturnings release clouds of deadly sulfurous gases into the lowlands. The greenhouse effect from the volcanic eruptions heats the planet to baking or sweltering temperatures, except when a major volcano spews so much ash into the sky that sunlight is reflected away and the planet can freeze over for tens to hundreds of megaseconds. There is native life, but these are the few stragglers which have survived a major and on-going mass extinction. Austen is a shirtsleeve-habitable world with comfortable temperatures, rich life on land and sea, and easily breathable air. It was once a thriving colony, but the run-up to the Zox-Homestead war saw Austen overrun and its populace exterminated by the Zox. It has never really recovered, although it has a small outpost of over a thousand people at the wormhole connector station of Mansfield. Avalon is an ice moon orbiting a large gas giant. Its surface is completely covered in ice sheets and glaciers, except for high mountain ridges and peaks. Oxygen levels are too low to survive outdoors without a breathe mask. A lost world, Bartholomew was once a prosperous colony and a full member of the Verge Republic. Bartholomew was cast adrift when its connection to the rest of the Verge, the world of Soretta, was overrun by Squirm. No one in the Verge currently knows its fate. Circumstance is a young, pre-biotic planet with a suffocating, reducing atmosphere of methane, carbon dioxide, and nitrogen. It has high geologic activity, and its sun is prone to occasional flaring. The only thing going for it is that the Circumstance – Prospect wormhole denies a large volume of space around the Verge Republic to the Zox Hierate. Being assigned to Circumstance is often considered punishment. Comstock has an unbreathable atmosphere, with negligible oxygen levels, high levels of carbon dioxide, and significant amounts of sulfur dioxide. The geology of Comstock is quite active, with many volcanoes and frequent earthquakes. It lacks complex native life, the most advanced life forms are layers of bacterial slime. Its main interest lies in its rich mineral wealth, which is being extracted by robot mining machines. Corvus is a rare example of a carbon world, one where the forming solar system ended up with an imbalance of carbon over oxygen in its overall makeup. The bedrock of corvus is diamond and graphite and silicon carbide, overlaid with a layer of wax, tholins, tar, and asphalt. Its rivers and seas are kerosene and naphtha, not water. The air is nitrogen and methane and ethane and enough of the extremely toxic carbon monoxide to make leaks in the seals of its instillations a serious concern. Corvus connector station sees some traffic as the way-point between Garcia's World and Jefferson. Corvus is also a prime source of carbon for the teraforming effort on Väinämöinen, and is mined (by robots) for bulk diamond and silicon carbide. Note that the toxic gas carbon monoxide is not the same as carbon dioxide. Standard CO2 filters and scrubbers will not remove it. Full SCBA gear is required to survive on the surface outside of sealed environments. Curtis is a heavy gravity world with a thick atmosphere under nearly perpetual cloud cover. There is enough oxygen to breathe, but at the risk of altitude sickness. Curtis is rather far from its star; the thick atmosphere keeps it from freezing over, but the average climate is chilly and the low levels of insolation provide little energy to the native biosphere resulting in less vigorous growth and overall low levels of biological activity. The helium in the atmosphere exacerbates heat loss in the typically low temperatures – visitors should take care to protect themselves against hypothermia. Curtis was once a significant node to many other colony worlds; worlds that were lost during the Bump in the Night. With exploration and re-contact efforts in the Verge ramping up, Curtis has seen an increased level of interest and activity. Low oxygen content make life on Durango difficult for those without high altitude genetic modifications or adaptations. Durango has no native land animals and very primitive native land autotrophes, generally non-vascular mats and mounds that only survive in damp places. Ocean life, however, is diverse, complex, and often large. The planet is being teraformed by introduction of Earth plants. Guǎngkuò is a water world. It's surface is entirely water. The oceans go deep, so deep that the pressure of the overlying water crushes the water underneath into exotic forms of ice. Whatever rock and minerals exist are locked so far under the ice mantle that its salts and minerals are inaccessible to the overlying ocean. Consequently, Guǎngkuò is unable to support much life. Its atmosphere is primarily nitrogen and carbon dioxide. The connector wormhole station between Zhǎngshān and Jiàngluò is on a near-surface submarine station, to protect it from storms and waves. A world with low oxygen levels. Most people will tire easily and are subject to altitude sickness; supplemental oxygen will alleviate this problem, and genetically adapted populations, or those genetically engineered for low oxygen tolerance, do not have issues. The average climate is rather chilly, with deep winters but warm summers (although there is significant variation, as with any world). Hóngtǔ is one member of a double world with Yánshí. Hóngtǔ was initially contacted by the Chinese government, who "encouraged" their restive native Tibetan population to move there. The hardy Tibetans have managed to persevere, although their colony is still low population. A relatively low gravity planet without complex surface life, Kartanum's atmosphere is low in oxygen and rather thin overall. As the last stop in the Verge Republic before entering Zox space, Kartanum is heavily guarded with extensive customs, diplomatic, and military presence. A major Republican Army base is set up on Kartanum to guard against Zox incursions. Those who serve on Kartanum receive free gene surgery to adapt them to low oxygen and low gravity conditions. Libre is a young colony world, mainly settled by pannovas from Solace. The world is Earth-like and shirt-sleeve habitable, although the tropics are exceptionally hot and ravaged by frequent hurricanes. The main settlement is in the rain forests of the temperate region (temperate in this case referring to the latitude and path of the sun overhead rather than the climate, which ranges from muggy to sweltering). Libre is a moon of an ice giant planet, and is tide locked to its ice giant primary. A moderately high gravity (1.4 g), high carbon dioxide, low oxygen, thick atmosphere world. Even with scrubbers, those without adaptations or gene surgery for low oxygen conditions will want supplemental oxygen as well. The overall climate is moderate to warm, but relatively low insolation means native life lives in the slow lane. The wormhole connector station is located on the Sarissa sea where the fata morgana optical illusion is reasonably common, hence the world's name. Morgana is a tide locked world around a red dwarf star. Noether orbits a G-class star (like Earth's sun, Sol) which has a binary companion in an eccentric orbit. This other star is a neutron star – one of those extreme exotic stellar corpses which are essentially a giant atomic nucleus with the mass of a star. The radiation beams from the neutron star regularly sterilize the surface and have stripped the world of its atmosphere and oceans. Noether station is located under hundreds of meters of bedrock, so passengers from New Carolina to San Agustín are not exposed to dangerous doses. A scientific research station is one of the few surface installations on Noether. Tourists sometimes visit when the neutron star's deadly beams are shining in safe directions, to view the spectacular supernova remnant nebula around Noether's solar system. A tide-locked world orbiting a red dwarf star, Othello is otherwise shirtsleeve-habitable. Once home to a thriving civilization of an indigenous sapient species, it is recovering from a technologically-induced mass extinction. This sapient species is believed to be extinct on Othello (although certain fringe elements say otherwise), and there is no evidence that they ever established any off-world colonies. Othello currently has a large research base of archaeologists and paleontologists to study this vanished people. Their extinction was sufficiently recent that it may be possible to de-extinct them. Providence was a thriving world and a full member of the Verge Republic before it was taken by the Squirm. The Squirm attacked in a surprise blitz that overran the cities and took the wormhole station. They used this to move on to Rocinante. After Rocinante was re-captured, the wormhole to Providence was broken to prevent further Squirm reinforcements. A habitable if somewhat warm world, Rocinante once had a moderate sized colony. That changed after the Squirm came swarming through the wormhole link to Providence. The majority of its inhabitants were killed, although some managed to escape to Homestead. These were quarantined, and those with Squirm parasitic infections were sent for treatment and wormhole removal. The Republican Army re-took Rocinante with assistance from Gummi forces. A significant garrison of Republic troops currently occupies Rocinante, in the event of a second Squirm invasion. Saberdag has plenty of highly fertile land, a temperate climate, and is rich in life. It would be ideal for colonization save for the fact that it is rather far from its sun – the only think keeping its climate comfortable is a thick atmosphere of mostly carbon dioxide. While there is plenty of oxygen, the CO2 in just a few breaths would knock any Earth animal unconscious and kill it within minutes. Gummis, which don't mind high CO2 levels, have established a small but growing colony on Saberdag. Once a thriving member world of the Republic, Soretta was overrun by Squirm. Its wormhole connection was deliberately broken when it was obvious that the world was lost. Sundance is a lost colony world, recently recontacted. Its oxygen level is low enough that some people suffer altitude sickness, although many recover with a week or so of acclimation, and most people tend to fatigue easily. It is otherwise very Earth-like, although its native land life is simple. It originally underwent some preliminary terraforming steps, to increase the oxygen level and introduce more complex life. Birds, with their sophisticated respiratory system, tend to thrive in comparison with mammals. The top herbivores are rattities (emus, ostriches, rheas, and cassowaries, with de-extincted species such as moas and elephant birds also present), and top carnivores are raptors (of the hawk-owl-and-eagle variety), seriemas, storks, roadrunners, and de-extincted phorusrhacids (also called terror birds). New and old world vultures, lammergeiers, and teratorns occupy the roles of giant scavengers. In tropical areas, carnivorous monitor lizards and crocodilians also thrive (including de-extincted mekosuchine land-crocs from Australia and New Caledonia) alongside herbivorous iguanas and tortoises. Its people's society collapsed after the Bump in the Night separated them from the rest of the galaxy. In the more than 3 gigaseconds (century) since then, the survivors have taken to a post-apocalyptic existence, scavenging relics from the ruins when they are not hunting and gathering or warring with each other. Tabita is a barren and nearly lifeless world. Its atmosphere is deceptively Earthlike, leading to its initial exploration. Early explorers found that its oxygen was generated by abiotic processes, primarily the photo-decomposition of water by near ultraviolet light in the presence of titania as a catalyst. Tabita currently hosts a small colony attempting to terraform the world. It is famous for its many spectacular rock formations, and sees a significant number of tourists. A young colony on an Earth-like and shirtsleeve-habitable world. With a population of a few thousand, the clement climate on the expanse of plains between the mountain arc to the west and the broad, shallow sea to the east looks like it will soon encourage many new immigrants and pose no impediments to the natural expansion of the colony size. A world mostly covered by global icecaps. Simple life exists in the seas, building the oxygen concentration up to low but breathable levels. Väinämöinen hosts a connector wormhole station and a small teraforming colony trying to break the planet out of its current iceball state by increasing the atmospheric CO2 concentration and spreading soot onto the ice sheets so they absorb more sunlight. Valhalla is a world with a breathable atmosphere of abiotic oxygen. Lacking sufficient nitrogen and argon in its atmosphere, there was no cold trap to keep its water from photolyzing to hydrogen and oxygen. This produced an atmosphere consisting primarily of oxygen and water vapor. Although the air is thin, it can sustain Earth life, although at the risk of altitude sickness. The thin atmosphere offers little protection against cosmic radiation. The very high proportion of oxygen to other gases in the air means that fires are very easy to start and burn particularly fierce and quick, in the presence of any fuel (including flesh) the slightest spark is likely to ignite a conflagration. Without life other than simple bacteria and archaea and little geological activity, Valhalla has no soil to speak of and few recoverable mineral deposits. Initial telescopic surveys of Valhalla generated excitement when oxygen and water vapor were observed in its spectrum, leading to disappointment when it was discovered that there was not much there. Winchester is a young colony on an Earth-like planet with a complex native biosphere. Its main town is home to a couple thousand souls, with another few thousand living in the adjacent countryside. A geologically active world with emerging oceanic life (mainly simple worms, slugs, and filter feeders) but no complex land life. Yánshí has an uncomfortably high gravity, and relatively low oxygen levels. A thick nitrogen atmosphere helps trap heat despite its distance from its sun, making the climate baking hot outside of the poles or climate-controlled facilities. Yánshí is one pair of a double world with Hóngtǔ.